The 2014 reimagining of the Toyota Aygo city car was certainly a brave one. Out went the staid-looking original and in came the funky second-generation car, with its divisive front-end sporting a large plastic ‘X’ shape extruding from the main body. ‘Go Fun Yourself’, Toyota proclaimed. This is the new, range-topping Aygo X-clusiv model, which comes with a roll-back canvas roof plus almost every other bit of kit as standard bar the optional £400 sat-nav. Driven here is a five-door example with a manual gearbox and that optional sat-nav, so it comes with a hefty £14,045 price. For a range that starts from as little as £8495, this new, high-spec trim will need to do a fair bit to justify its cost. For the record, there is another Aygo with a canvas roof: the mid-spec X-pression X-Wave, which costs from £12,790. The Aygo shares its underpinnings with the Citroën C1 and Peugeot 108, which are both praiseworthy city cars in their own right. Then there's the oh-so stylish Fiat 500C convertible, the entry-level version of which is almost identically priced to this Aygo X-clusiv. The X-clusiv is only a new trim level, so the car underneath is no different from other current Aygos. The only engine available is a 1.0-litre three-cylinder VVT-i. Naturally, it places its focus on efficiency, and the official figures of 68.9mpg combined and CO2 emissions of 95g/km are class-competitive. Around town it’s more than responsive enough. There's good flexibility within gears and the performance is sufficiently peppy to allow you to pull away from traffic lights with minimal effort. Nimble handling only adds to the Aygo’s intrinsic ability for ducking and diving through narrow streets, and it also has a pleasantly surprising amount of steering feel for the class, rounding corners with enthusiasm and accuracy. The manual gearshift has a slick action and changes takes place with minimal fuss. There's also a shift light in your line of vision that's useful when you’re watching your fuel economy. One slight issue with the gearbox is the closeness of the gate: you can easily engage the wrong gear if you're not careful. The ride is decent, so the Aygo deals with big bumps well, but on undulating surfaces it can be fidgety. As a result it's not up to the standards of the best city cars, such as the Volkswagen Up or Hyundai i10. 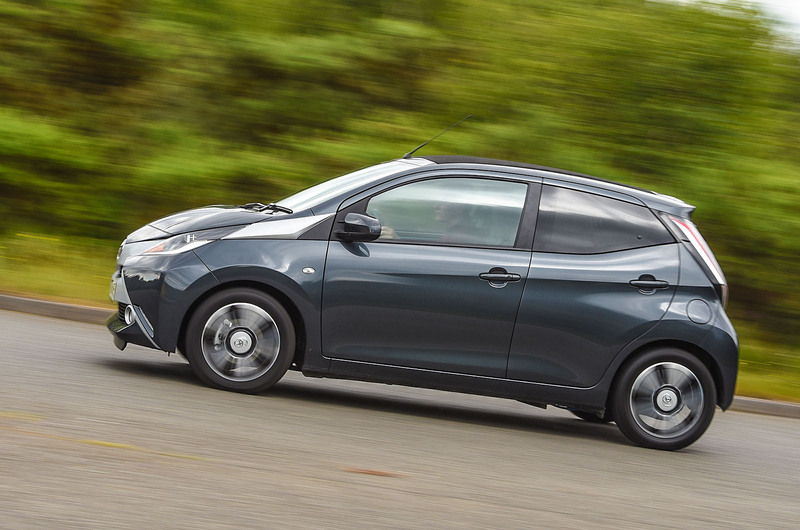 Take the Aygo on the motorway and you’ll be pleasantly surprised. You have to push fairly hard to get up to speed on shorter slip roads, but you don't struggle as much as you might expect for a city car. In fact, the most annoying aspect of travelling at speed is the amount of wind noise you get coming off the canvas roof when it's closed. Inside, the X-clusiv doesn’t quite live up to its name. Certainly the leather seats and steering wheel add an air of finery, but there's no hiding the rest of the scratchy plastics on the dashboard and door cards. Generally this is the norm for the city car class, yet VW manages to apply a better-looking sheen to its Up models. 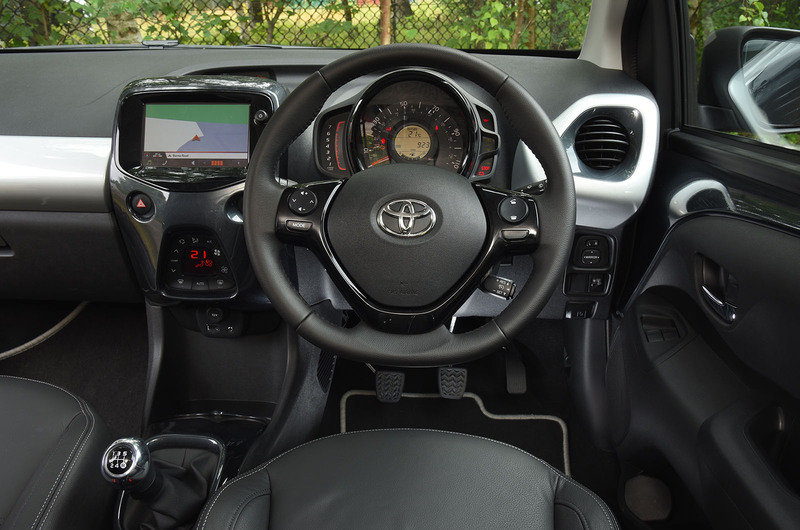 The Aygo's seats provide a comfortable, upright driving position, with fair adjustment, but the steering wheel only adjusts for rake, not reach. This X-clusiv’s standout feature is its canvas sunroof, which can be opened at any speed. On a perfect summers day it bathes the interior in sunshine, which certainly makes even the most mundane trip that bit more enjoyable. The infotainment system is pretty intuitive and functional, with a clear Bluetooth connection, easy to work sat-nav and a decent-sounding stereo. Our only qualm is the speed camera warning that sounds more like a military klaxon than a gentle reminder: thankfully, it can be turned off. X-clusiv trim also brings ‘privacy glass’. It seems a little unnecessary on such a small car, and at night makes picking out objects in the rear-view mirror trickier, rendering following cars as ghostly floating lights. Overall, the Aygo is a modern, pleasurable urban hack and, subjectively at least, one of the more excitingly styled city cars on sale at the moment. It generated far more compliments than, say, a VW Up might. But it’s no class leader. On top of that, this X-clusiv trim makes little financial sense. It may have all the tech and a canvas roof, but it doesn’t come close to justifying its price tag. If you really have your heart set on an Aygo, think about one of the cheaper models and pick a few options that take your fancy. If you must have the sunroof, then go for the mid-spec X-pression X-wave. I really like the look of this latest Aygo, much more interesting and better resolved than the Citroen and Peugeot versions. This sort of fabric roof is a far better idea than the compromised one fitted to the likes of the 500C and DS3, too: Almost as big an opening but you still keep your hatchback versatility and rear vision. As the article says, the lower range models have got to be a better bet, preferably without the privacy glass, which is not only "unnecessary" but as always, spoils the looks as well. I bought the new semi-automatic Aygo and have been driving it from the second week in August. It's a fantastic car and I've had scores of compliments because of the black wrap over the ultra white bodywork which makes it really stand out. I haven't encountered the exact same combination of colours yet, which also makes it all the more personal. I only buy Japanese cars and in the showroom where I purchased it,I was told not one person has had to use the 5 year warranty which comes with the vehicle. I've been driving Japanese vehicles for very many years and I tell other people who want something reliable, always to do likewise. I've driven too many other makes in the past and nothing compares to Japanese and that's because I know very little about cars, but do know what drives well and what's reliable. Sorry Mary Willis, but its only Japanese in so much as its got a Toyota badge on it! Its the same car underneath as the Citroen C1 and Peugeot 108 and even built in the same factory in Kolin Czech Republic, not Tokyo. I think your ok with regards the engine, as I believe the 1.0VTi68 unit is indeed a Toyota designed unit, whereas the Pug and Citroen are also available with the PSA Groups 1.2 PureTech 82 units, not available in the Aygo. And if the dealer has told you that NO-ONE has ever claimed on the 5yr warranty, then I think they lied to you....not that a car dealer would ever lie, would they? When all's said and done, whether its Czech or French or Japanese, its still a good car and that's what matters!